The Heritage Softail is a great choice for touring because of the superb riding position and overall easy feel of the bike. The Heritage uses the balanced version of Harley’s Big Twin, the engine being directly mounted to the frame with vibrations decreased via a counterbalancer. This give the Heritage a rawer, more vintage feel. 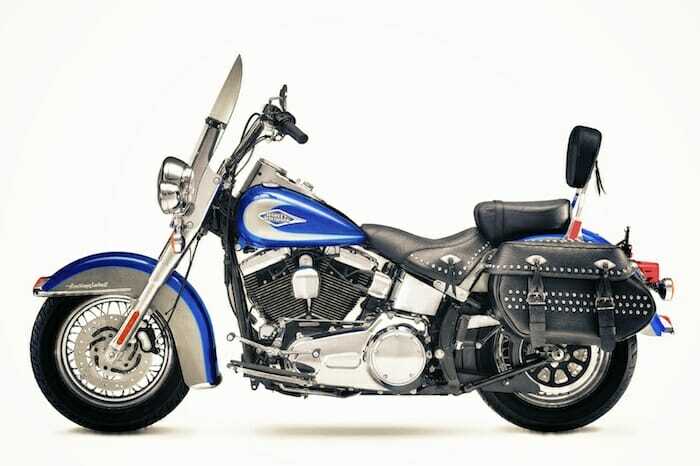 And this is a Softail, with the rear shock hidden under the bike to give a “hardtail look”. Both the motor and the suspension combine to give the Heritage a less smooth feel than a Road King, but a bit more personality; many riders prefer this. Stopping performance is a bit compromised due to the single front disc rotor. Pillions have a bit less comfort than the full Harley touring machines as their feet rest on standard pegs, not floorboards. For longer tours two-up, we’d recommend a Road King or ideally an Electra Glide Classic as a more comfortable alternative. The Heritage does have a ride-by-wire throttle and fuel injection, so don’t make the mistake of thinking it’s an antique. If you’re looking for a bike with a nostalgic look and feel, the Heritage is the one. It is wonderfully minimal, which is somehow very satisfying. Especially if you’ve done lots of miles on other touring bikes, the Heritage is worth a try, if only to taste something a bit different. One thing to be mindful of on the Heritage Classic….tubed tires seem more susceptible to flats than tubeless, so don’t ride on the shoulder of roads where debris collects, as you’ll dramatically increase your chance of a puncture.